Planning a trip to Iran, and not sure what to bring back as an edible souvenir for yourself, or a thank you gift for the kind soul who’s watching your pet or child while you’re away? Our suggestion is saffron, which is typically believed to be native to the Mediterranean, Asia Minor, and Iran. Saffron has been used for thousands of years as a seasoning, fragrance, dye, and medicine. The stigmas of the flower are harvested and processed by hand which is very labor intensive and the reason why Saffron is considered the world’s most expensive spice. 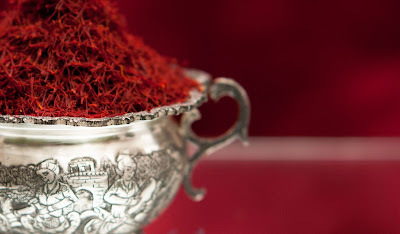 Many Iranians believe that in its pure form, saffron works as an antidepressant and a culinary weapon against Alzheimer’s, cancer and degeneration of the eyes and that is why saffron is omnipresent, in Iranian recipes. We suggest you to indulge buying this edible ruby from Mashhad, Isfahan, and Shiraz, the producer of more than 80 percent of this valuable spice in the world.